“MONKEY!” – Race Director Trent Rosenbloom (Monkey Trent, Bib # -1) starting the race instead of firing a starter’s pistol. It’s a long wait from the beginning of August, finding out that you won the lottery, to donning an official Flying Monkey Racing Bib on race day. 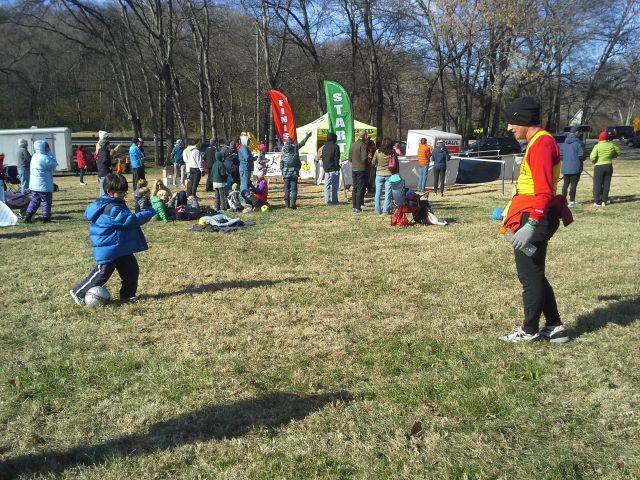 This year, I was one of 24 runners (7%) who had ran four previous Monkeys (2008, 2009, 2010, 2012). I’ve run a couple other venues multiple times including Richmond Marathon (1999, 2000, 2001, 2002). The trip to Nashville includes a visit to the Adventure Science Center where The Boys can run around like the crazy kids they are. In 2012, we went to the Science Center after the marathon and somehow I managed. I was very grateful that we were going before the marathon. Also part of the Monkey Tradition, we stay at the Candlewood Suites near race start because it’s fairly reasonable and plenty of space for The Boys to stretch out and more importantly, Jen and I get to watch some Football on TV. One of the drawbacks of running the same race, especially a long distance race, the different races tend to blend together. However, sometimes there is something, maybe just one thing that stands out. This year, it was the cold. I was cold from my head to my feet, especially my feet. It felt like I had extra socks crammed down in my shoes. Turns out my toesies were numb and it took about 2.5 miles for them to finally warm up. Once they were warm, everything felt normal. I even took off my outer shell jacket to help regulate my temperature. 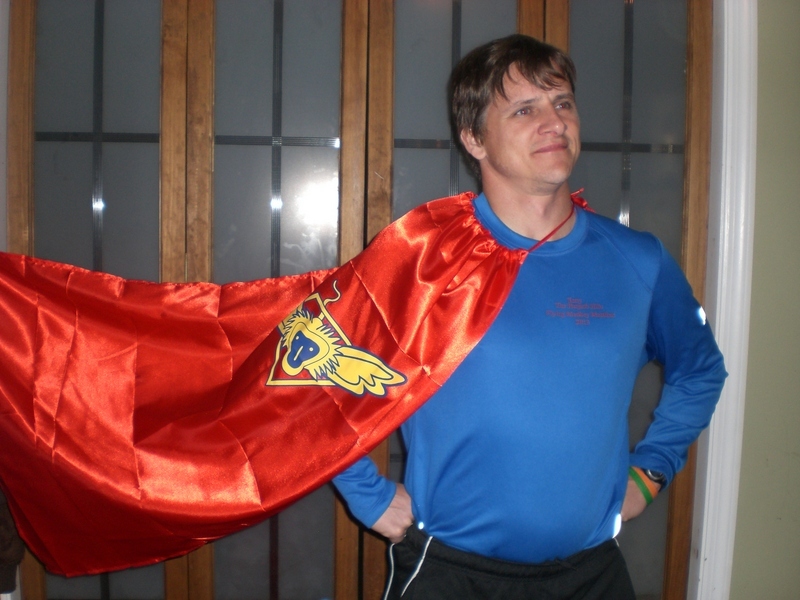 I didn’t train like I wanted between the Darlington Marathon on September 28th and the Flying Monkey. As a result, I guessed that I would finish somewhere between 4:45 and 5:00 if everything went well. Besides the cold temperature, the wind was brisk, not strong but enough that you really didn’t want to be in it if possible. Almost all of the course is protected by the trees and the ‘Big Hills’ that the course was laid upon. I did see a family that was having a photo shoot, out in the cold, in the wind… in the cold. They were gone when I came back around, so I don’t know how their photoshoot went. One of the neat things about the Flying Monkey is currently, the bib number you get running your first Monkey stays with you… forever. For me, it is #438 and I have my own little game that I call, Beat The Bib. In this game, I, Terry run the Flying Monkey in less than 4 hours and 38 minutes. However, as the higher miles passed by, I realized that I would finish within the time frame that I thought and not Beat The Bib. 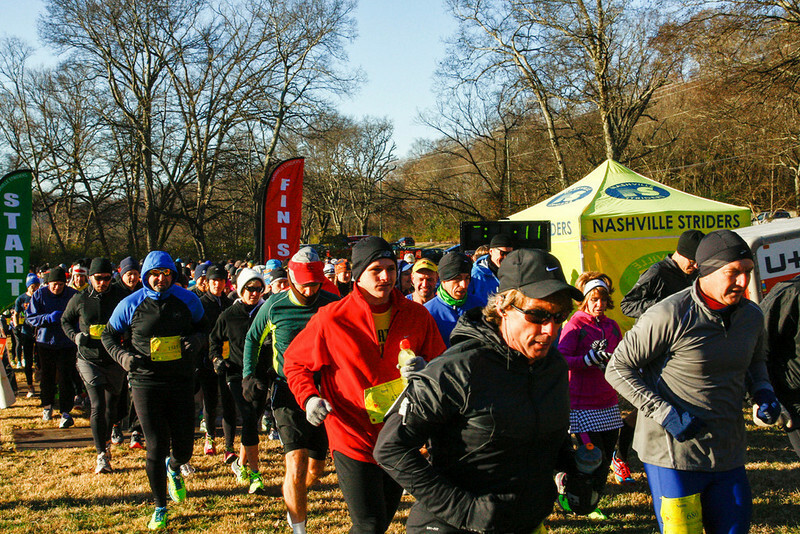 The last 1/4 of a mile or so of the course is off road, as you head off the roads in the park and head to the finish line. This year, I was alone when I left the asphalt, both in front of me and behind. I’m usually sizing up the runners ahead of me to see who I can pick off in the last tenth of a mile of the race while at the same time conscious of people behind me to avoid them doing the same to me. Without any runners around me to worry about, it was just me and the clock battling it out. As I inched nearer to the finish line, the clock kept counting, taunting me that I had not Beat My Bib this year. 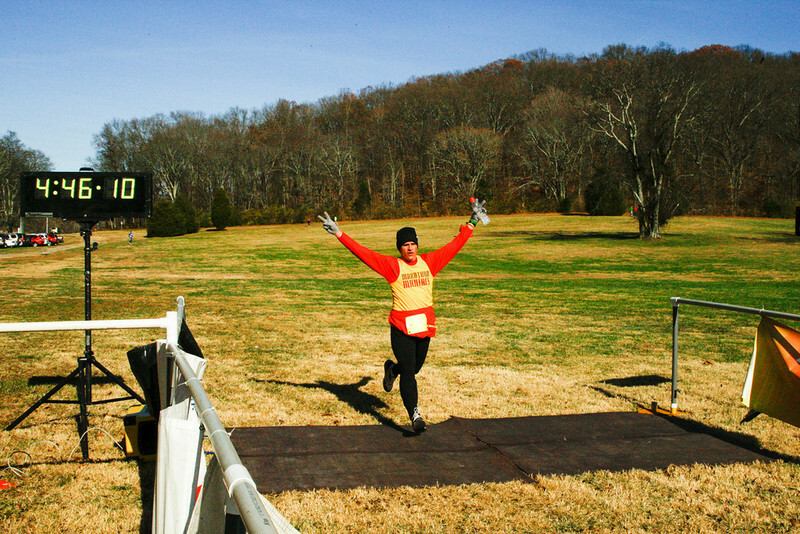 Soon enough my running of the 2013 Flying Monkey Marathon was over. I was finished. I went straight to the nearest volunteer that I saw holding the finishers medal, so that I could be knighted as a finisher. 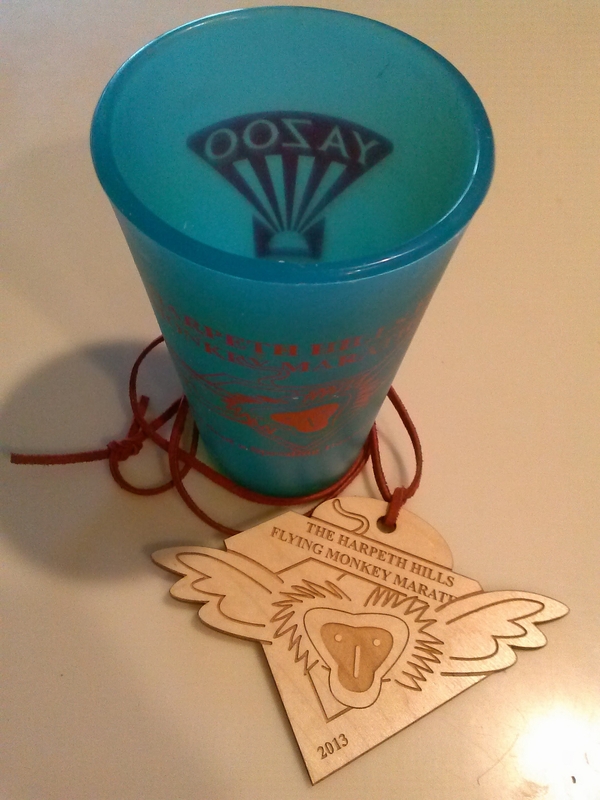 For the second year in a row, finishers were given a Silipint Cup with the race logo. A Silipint is a silicon pint glass, I didn’t use last year’s mug much at all. The 2013 mug, I use on a daily basis. Each runner is given a custom shirt personalized with your “race name” on the breast (it’s tough to see on the previous picture) and on the sleeve, the number of previous Monkeys you have ran previous to Race Day. 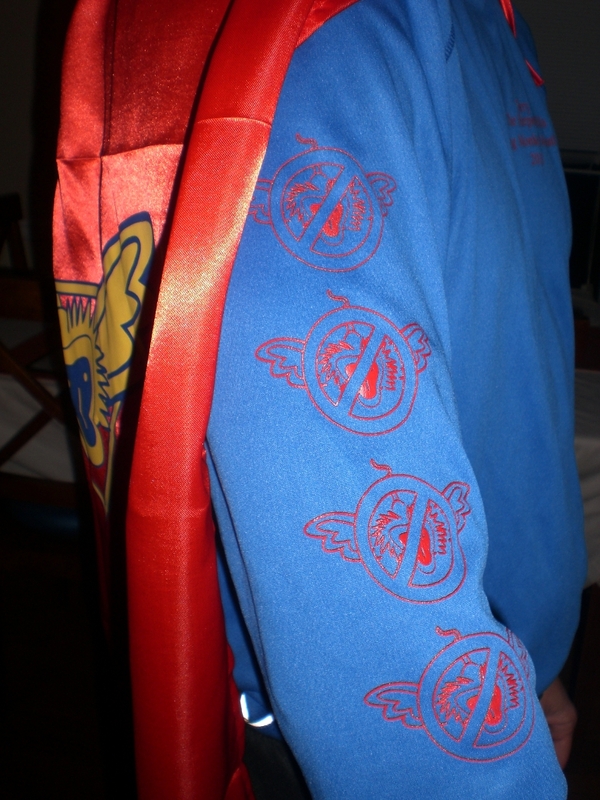 As mentioned above, I had already ran the Flying Monkey 4 times… and there is the proof. Next year, I will get 5x Monkey Kill Badge… if I get a win in the lottery. 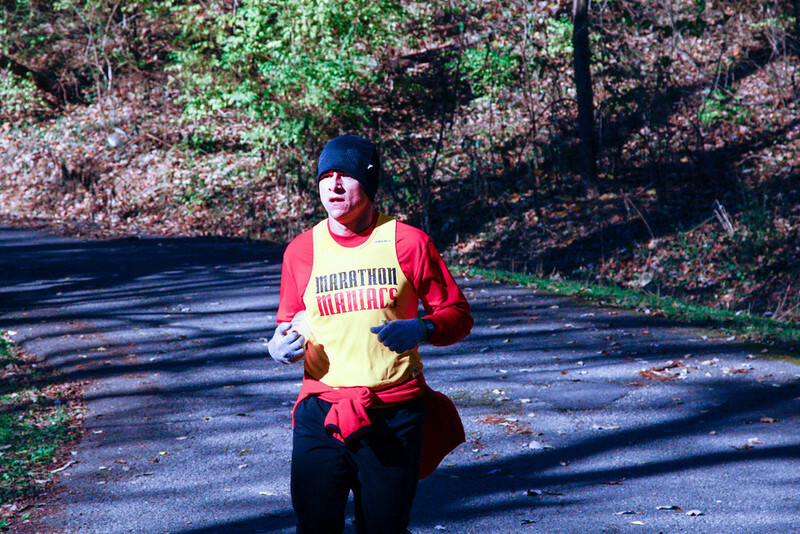 This entry was posted in running and tagged flying monkey marathon, race report. Bookmark the permalink. Awesome! Just awesome, Super Dad!